Rum aficionados Tom Bocchino, Kim McGonnell and Brian O’Neal at Doc Ford’s. Photo by Gina Birch. Rum flights are a good way to learn about this spirit. Photo by Gina Birch. 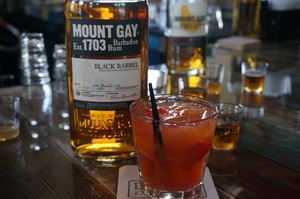 Above, Mount Gay 1703 can be used in cocktails or as a sipping rum, where its flavors shine. Photo by Gina Birch. If you think rum is just for high-fructose cocktails, booze cruises and beach parties, think again. It’s a spirit that has many faces, and while it has a near-permanent place with the party people, it also has a seat at the table filled with people of discerning palates and refined taste. “Because of the craftsmanship going into it and how some are made, connoisseurs love high-end rums to sip on,” O’Neal says. Mount Gay is the first documented rum distillery (1703), but O’Neal says evidence of rum making has been found dating back to the 1600s. Made in Barbados, from molasses, Mount Gay is set apart from others in the world of rum because of the water used in its production. Coral limestone beneath the Caribbean island acts as a natural filter, producing pure, delicious spring water for distilling. Mount Gay’s 1703 is full bodied and tastes like winter, with flavors of maple syrup, cinnamon, pepper, smoke, vanilla and bacon. You could drink this in a snifter while eating a steak. Although some of the best rums are produced in the Caribbean, there is no denying the expertise with which Dos Maderas PX 5 + 5 is made. From Spain, it begins as two different rums, aged separately, then combined and aged again in a sherry cask, Bocchino explains. It’s clean, with a little licorice, and it’s a favorite of McGonnell. These rums are quite special and at their best when served neat or on the rocks. Store shelves are lined with premium rum selections, and it can be confusing when choosing one better suited for sipping than mixing—or one that can satisfy both. A great way to learn is through a tasting flight, where several small pours of different brands are lined up for sampling. This is where you can taste the difference between molasses and sugar cane, the amount of time spent in the barrel and other attributes. 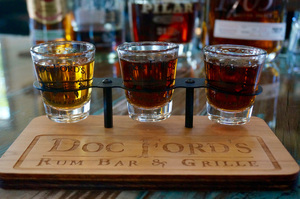 Many rum bars and restaurants that specialize in high-end and/or small-batch spirits offer flights, Doc Ford’s included. Since rum making flourishes in tropical climates, it makes sense that Florida has a few producers. Papa’s Pilar is a popular brand, made in Key West and inspired by Ernest Hemingway. It comes in blonde and dark varieties, and is suitable for sipping or mixing. Wicked Dolphin is Southwest Florida’s first rum distillery. Over the years the award-winning operation in Cape Coral has added flavored varieties and barrel aging to its portfolio, as well as tours and tastings. The natural sugar in rum lends itself well to mixers. On the flip side, this attribute makes it so easy to go over the top. The unpleasant “morning after” has tarnished rum’s reputation over the years, making it the spirit you want to take home but not marry. However, there are many worthy of commitment. A mature, barrel-aged rum has just enough sweetness and depth of flavor to be savored and coddled—much like a bourbon or brandy—after a long day, a fulfilling meal or while solving the problems of the world with your best friend. 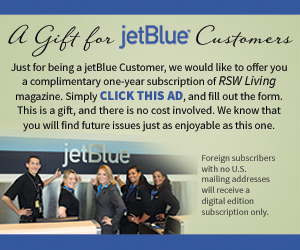 Try it next time. Cheers.